It is considered a cornerstone of training in the Bujinkan. Now it is available in English. The translator is Don Roley, who lived in Japan for 15 years studying the art and went over the book with his teachers for insight. If you are serious about learning this craft, then you will have to view the never before seen information about the subject. Once constructed, these smoke devices can serve for a variety of uses such as attacks or evasions, and also diversionary tactics. Starring : Master Shizuya Sato. His father’s personal friends and judo compatriots included many preeminent pre-WWII Kodokan instructors, all of whom lent their personal guidance and lifelong support to Sato-sensei. Mind you, trying many of the things in this book will lead to serious injury or death. There is enough to show how it is all science, and little more. As the translator, I take no responsibility for any use or misuse of this knowledge. I have a framed print by Gregory Manchess. Gregory Manchess did a lot of the artwork for Stephen Hayes books. Title states "Night Assault Legends of the Ninja 1992". The print is signed and inscribed by Manchess. The print symbolizes the stealth and invisibility of the ninja. I have been able to find zero of these prints available. The dimensions, including the frame, measures: 25" x 19" Feel free to ask any questions. Thanks for looking. I have an impossible to find, Shadows of Iga pin up for sale. This item is a piece of history and these items never become available. The pictures shown of the exact item purchasing so please review photos for condition. Feel free to ask any questions. I have hundreds of Hatsumi and martial arts items to post so check back often or even feel free to ask! I have an impossible to find, Shadows of Iga Ohio Ninja Festival Patch up for sale. The event took place in Dayton, Ohio. This item is a piece of history and these items never become available. The pictures shown of the exact item purchasing so please review photos for condition. This patch is very old and does have some wear. Feel free to ask any questions. I have hundreds of Hatsumi and martial arts items to post so check back often or even feel free to ask! Toshitsugu Takamatsu Framed Portrait- Bujinkan Ninjutsu- Rare! Item is a portrait of Toshitsugu Takamatsu. I have no idea as to the age. With the frame included, it measures 15" long x 12" wide. View photos for condition. Feel free to ask questions. I also have tons and tons more paintings and Hatsumi items to list as i find time, so feel free to ask and check back often. Hanbojutsu Juttejutsu Tessenjutsu Framed Portrait by Hatsumi- Bujinkan- Rare! Item is a portrait of Masaaki Hatsumi. This particular portrait is the same photo used in Hanbojutsu Juttejutsu Tessenjutsu. I have no idea as to the age. With the frame included, it measures 15" long x 12" wide. View photos for condition. Feel free to ask questions. I also have tons and tons more paintings and Hatsumi items to list as i find time, so feel free to ask and check back often. I have my rare copy of Togakure no Ninja up for sale. The book appears to be brand new but please use your own judgement, as far as condition goes. The pictures shown of the exact item purchasing. Feel free to ask any questions. I have hundreds of Hatsumi and martial arts items to post so check back often or even feel free to ask! Jonathan Peeden SIGNED print-ninjutsu bujinkan hatsumi- RARE! I have a framed print by Jonathan Peedin.The print is signed by the artist and has some hand drawn on features. Peedin's artwork is valuable to martial arts and ninjutsu. He has done art for both stephen hayes and hatsumi's books. I have been able to find zero of these prints available, good luck finding another. You simply won't. The dimensions, including the frame, measure: 14" x 11" Feel free to ask any questions. Thanks for looking. I have an original photograph autographed by Masaaki Hatsumi up for sale. It is framed. The pictures shown of the exact item purchasing. Feel free to ask any questions. I have hundreds of Hatsumi and martial arts items to post so check back often or even feel free to ask! Doce Pares (Spanish for twelve pairs) is a form of Arnis, Kali and Eskrima, or a Filipino martial art that focuses primarily on stick fighting, knife fighting and hand-to-hand combat but also covers wrestling and other weapons as well. Kukishinden Ryû. This modern training book should primarily be regarded as basic manual for daily training. The training manual of the. Gyokko-Ryû and Takagi-Yoshin-Ryû are also available ! Koto-Ryû, Togakure-Ryû, Shinden-Fudô-Ryû Jûtaijutsu, Shinden-Fudô-Ryû Datentaijutsu. Vladimir Vasiliev, Systema Head Instructor and Russian Special Operations Unit professional, takes you to a level beyond the obvious and demonstrates stunning ways to deal withground attacks, hand-to-hand combat, multiple opponents and knife attacks. I have an impossible to find, Shadows of Iga 1983 Ohio Ninja Festival Patch up for sale. The event took place in Dayton, Ohio. This item is a piece of history and these items never become available. The pictures shown of the exact item purchasing so please review photos for condition. This patch is very old and does have some wear. Feel free to ask any questions. I have hundreds of Hatsumi and martial arts items to post so check back often or even feel free to ask! I have an impossible to find, Shadows of Iga Nin-po Ik-kan Patch up for sale. This item is a piece of history and these items never become available. The pictures shown of the exact item purchasing so please review photos for condition. This patch is very old and does have some wear. Feel free to ask any questions. I have hundreds of Hatsumi and martial arts items to post so check back often or even feel free to ask! 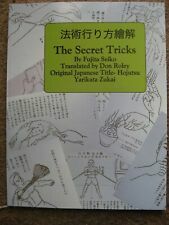 This book has a lot of illustrations in it and explains many Kodokan waza with them. Author Ishiguro leishichi. Title Intrduction to Judo. Publication year 1950. Acceptable.Yellowing and stains on the pages. You can learn early Kodokan Judo Kata by looking at them.A must-have one if you are interested in early Kodokan Judo. Title Zukai Judo Kyohan(Illustrated Arima Judo textbook). Author Arima Suiomi. Publication year 1925. Title Ninjutsu Hoten. By Fujita Seiko. Publication year 1955. VERY VERY RARE original old handwritten scroll and signed by Nakayama Hakudo. Nakayama Hakudo was arguably the most influential martial artist in modern Budo history. Nakayama Hakudo (1872-1958) was the founder of Muso Shinden-Ryu and held ranks in ranks in Kendo, Iaido and Shinto Muso-Ryu Jodo. Title:MUSO JIKIDEN EISHIN-RYU IAIDO KYOHAN. by MITANI YOSHISATO. Used, good. Pages : 319 pages. EMS USD33 USD45 USD50. SAL Free Free Free. Publisher : NICHIBO SHUPPAN-SHA. Hand-Drawn Artwork by Masaaki Hatsumi Bujinkan Ninjutsu- RARE! Item is hand-painted by Masaaki Hatsumi. Painting w/ the frame included measures roughly 16" long x 13.25" wide. Item appears very old. This was hand drawn some time pre-1990. After taking it apart to view it, it was drawn on the back of a ninjutsu waiver form. In the bottom left corner you can see the initials "mh" for Hatsumi. Usually a lot of his his artwork has the stamps but this was done crudely on the spot vs done formally (hence why its done on the back of a waiver). Feel free to ask any questions. View photos for condition. I have a framed ninjutsu print up for grabs. With the frame, measures roughly 11.5" x 9.5". Feel free to ask questions. Thanks for looking. This is a very rare book written by Takano Hiromasa,who is a famous Kendo player.He is a second son of Takano Sasaburo,who is a a famous Japanese kendo Master. Author Takano Hiromasa. Takano Masahiro is know as a Nakanishiha itto-ryu Soke. Title Arima Judo kyohan. Publication year 1917. I have an original, rare book by Hatsumi up for sale. The pictures shown of the exact item purchasing. Feel free to ask any questions. I have hundreds of Hatsumi and martial arts items to post so check back often or even feel free to ask! I have a very hard to find AUTOGRAPHED Ninja Realms of Power by Stephen Hayes up for sale. The pictures shown of the exact item purchasing. Feel free to ask any questions. I have hundreds of Hatsumi and martial arts items to post so check back often or even feel free to ask! Item is hand-painted by Masaaki Hatsumi and is 100% authentic. Painting w/ the frame included measures 13" long x 4.5" wide. Feel free to ask any questions. As far as the inscription, i have no idea what it says. I also have tons and tons more paintings and Hatsumi items to list as i find time, so feel free to ask and check back often. Due to the obscurity and rarity of some of these items i am just guessing at prices as i go, they have no concrete value and are priceless. Thanks for looking. I have a very hard to find the Ninja Times Newsletter up for sale. The pictures shown of the exact item purchasing. Feel free to ask any questions. I have hundreds of Hatsumi and martial arts items to post so check back often or even feel free to ask! 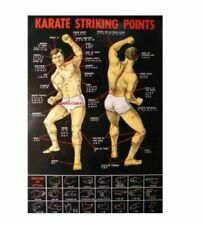 Title Illustrated Karatedo Course from the beginning to adavanced. Publication year 1962. Title Sepai no Kenkyu. Author Mabuni Kenwa. Publication year 1934. Title New Judo Newaza. This is a very rare and illustrated book on Kodokan Judo.It was written by Hoshizaki Haruna,who was a student of Mifune Kyuzo. 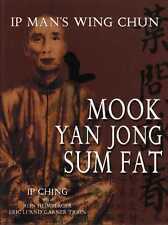 This is the first book to explain Judo techniques with successive pictures. Supervising Editor Kyuzo Mifune,Kazuzo Kudo.